As I implement my New Year's resolution to eat more fruits and vegetables (again), I realized that I needed a refresher on what a serving actually equates to. The United States Department of Agriculture sets a serving size for fruit or vegetables to be equal to about one-half cup. Greens like spinach and lettuce have a serving size equal to one full cup. One serving of sliced fruit is equal to one-half cup; however a single piece of fruit, such as an apple or an orange counts as one serving. How did the USDA decide that one-half cup is a serving size? The decision was based on the portion sizes that people typically eat, ease of use and nutritional content of fruits and vegetables. Many experts suggest we need from five to nine servings of fruits and vegetables every day. That is a total. Older or inactive women and smaller children need at least three servings of vegetables and two servings of fruit. Growing kids, teen girls, most men and active women would eat at least four servings of vegetables and three servings of fruit everyday. 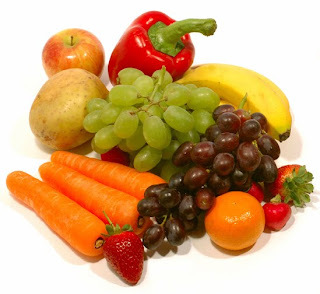 Teen boys and active men should eat at least five servings of vegetables and four servings of fruit. Unfortunately many people fail to eat even five servings each day. And don't forget the easiest way to pack in the fruits and veggies - smoothies and juice. When I need a boost, I start juicing. It seriously energizes me and it will do the same for you.